The environmental impact of Club MAC is important to us all, and we know it’s something that our guests care about too. Of course, a resort the size of Club MAC welcomes thousands of guests every year. And we go through a lot of resources to make sure their holidays are as much fun as possible. 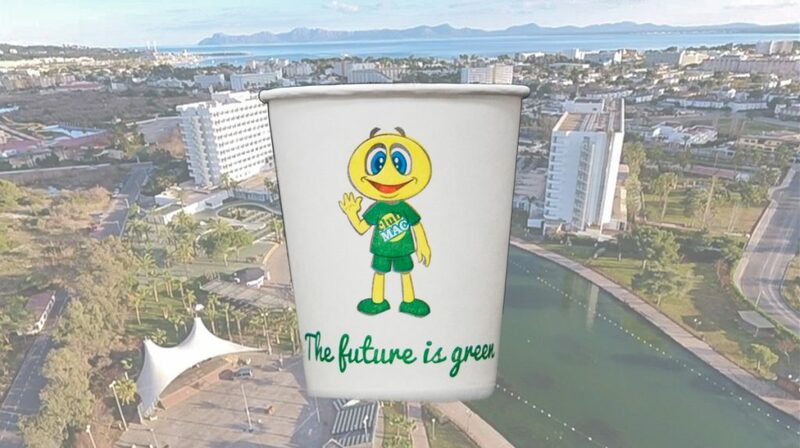 Our focus in preparing for our green changes has been mainly on kicking plastic out of our products and off the resort. We’ve changed all adult glasses, which used to be plastic, into a hard-plastic reusable glass. Guests will hire them against a deposit of one euro each. When it needs cleaning, you just swap it for another one at the bar and when you don’t need it anymore, just swap it for a card which will enable you to get a new glass when you need it again. At the end of your stay at Club MAC, you simply return the glass and get the deposit back. We’ve also tackled children’s drinking glasses, which have traditionally been plastic. As we understand that children are more likely to lose their glass, we aren’t using a deposit scheme. Instead, we’re introducing cardboard glasses with a Macky design. They’re designed to be recycled after use. We have also eliminated as much plastic as possible from everything in our self-service snack area, and in the Lake Burger bar. We’re actively working to reduce the use of plastic straws in the bars and plastic wrapping used in the on-site shop too. Club MAC Alcudia takes its position within a conservation area seriously, and we hope to make a real inroad into the environmental impact of our resort. In total we have eliminated more than 7,400,000 plastic products from the site. Here are some figures to show how much impact this will have. 27,600 Club MAC t-shirts Changed plastic packaging to paper. 8,000 plastic spoons Swapped for wooden spoons. 104,000 plastic coffee spoons Eliminated. 114,000 plastic knives Swapped for wooden knives. 1,540,000 plastic straws Eliminated apart from for slushies. 77,200 foam plates Swapped for plates made of sugarcane. 62,000 plastic forks Swapped for wooden forks. 459,000 foam glasses Swapped for cardboard glasses. 62,500 plastic beer glasses Eliminated. 478,836 San Miguel glasses Eliminated. 1,847,484 clear plastic glasses Eliminated. 1,500 clear tube plastic glasses Eliminated. 2,175,000 clear plastic glasses Swapped for Macky cardboard cups. We’re really proud of all the changes we’ve made for 2019, including the upgrades to all of our rooms. Our Standard rooms have lots of extras this year, all of which used to be chargeable extras. These include a TV with unlocked channels, an in-room fridge, a kettle, free WiFi, air conditioning, a safe, and a hairdryer. Family suites and Premium rooms have all of this, and lots more of their own extras for 2019. These include welcomed drinks in the fridge when guests arrive, a discount voucher for use in the on-site Club Mac shop, a pack of kids’ toiletries, various branded spirits at our all-inclusive bars, swimming pool towels against a deposit and free entry for kids to Fun World between 10 am and 6 pm every day. The best way to secure your family holiday at Club MAC Alcudia for 2019 is to book directly on our website. Drop us an email at booking@clubmac.es, and we’ll help you with any questions you may have. Don’t forget that it’s just a 10% deposit, which is refundable all the way up to midnight the night before your arrival date.